Current vehicles utilise a variety of Brake and Stop light switches and sensors that monitor the many stages of the brake pedal position, from a fully released position, to monitoring the position of the pedal as it is fully depressed. 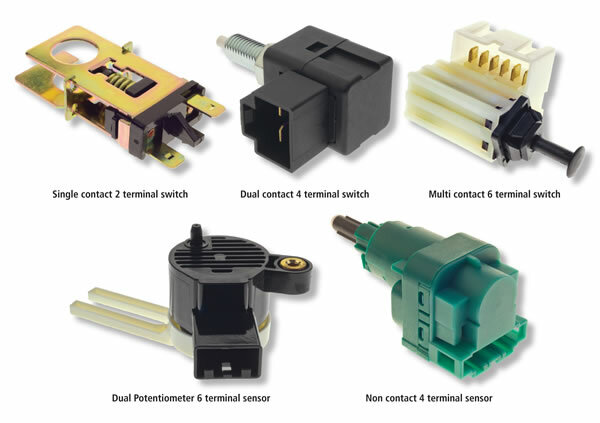 These switches and sensors vary from a simple two contact switch for brake light operation only, to multiple contact sensors/switches for ABS, Cruise control, push button start, stop/start systems, regenerative braking and other many uses. Recent sensor developments include, single or dual potentiometer sensors for full brake pedal movement monitoring. These can be implemented in brake safety and start systems, and even clutch system monitoring. Brake pedal position sensors for Regenerative Braking Function. As we all know, the energy created during conventional braking is mostly dissipated in the form of heat. In the regenerative braking system of hybrid or electric vehicles, much of the braking action is carried out by reversing the electric motor when the brake pedal is depressed, causing the vehicle to slow down and also allowing the motor to act as a electric generator and store that energy in the vehicle batteries. Friction brakes are used in conjunction with and as a back up when the regenerative braking is insufficient. The brake switch plays a major role in the control of this system. Due to the vast range of contact- and non-contact switches and sensors available, the testing procedures will vary. Even though single or multiple contact switches may be quickly checked for resistance and voltage with a multi meter, this check is not possible or accurate on all the electronic type units. The use of suitable scanners or suitable oscilloscopes are the preferred test methods. 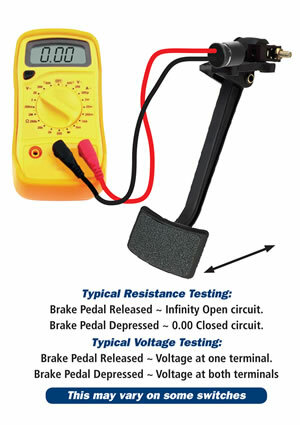 Simple brake switch test only. Understanding the brake light circuitry is also very important to determine a failure in the stop light system. Many vehicles utilise multiple modules rather than direct switch / globe operation even when fitted with simple contact brake light switches. 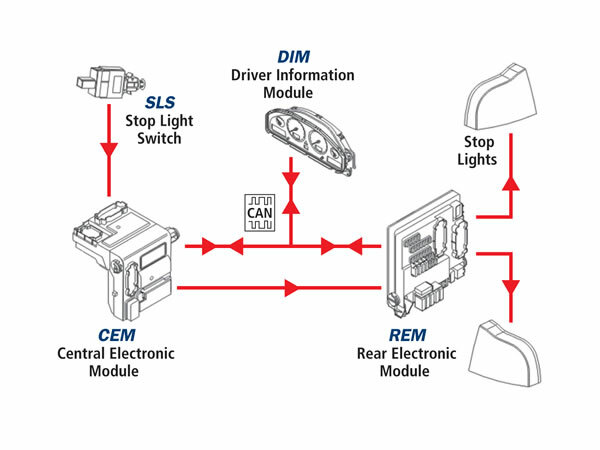 When the brake pedal is depressed and the stop light switch is closed, the Central electronic module (CEM) transmits a signal directly to the Rear electronic module (REM) internal relay which powers the stop lights. At the same time the CEM transmits data (via CAN) to the REM that the stop light switch has been activated. In event of a fault, the Driver information module will display a text. The 3rd high mounted stop light is powered directly by a separate circuit from the Rear Electronic Module and will be illuminated as long as the stop light switch is closed. If a vehicle has no main stop lights, but the 3rd high mounted stop light illuminates, we know the switch is functioning and as long as the stop light globes are suitable and not faulty, we would need to concentrate further tests on the REM. Failed stop light switches / sensors can cause a variety of driving conditions as their function on a modern motor vehicle is more than just operating the stop lights. A cruise control system with a programmed road speed that will not cancel when the brakes are applied. An ABS / Traction and Stability control system that will not function and display warning lights on the instrument panel. A push button start system that will not start without the brake pedal signal. A selector lever that cannot be moved from the “P” range due to no brake pedal signal. Seat belt pre-tensioning malfunction during hard braking. All these and more major conditions may be caused by this simple but very important switch / sensor, and it should be tested as part of vehicle fault diagnostics. A full range of Premier Auto Trade replacement Stop Light Switches and Sensors is now available with over 120 part numbers covering over 95% of vehicles in Australia.